Neco H156ME, Semi-Integrated, Sealed Cartridge, 1-1/8"
To run the forums, host the website, and travel, EBR charges a universal service fee for reviews. This in-depth review was sponsored by EUNORAU. The goal is to be transparent and unbiased, this video and written review are not meant to be an endorsement of EUNORAU products. 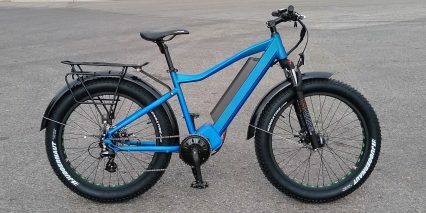 The EUNORAU FAT-HD is one of the more powerful production eBikes on the market today. 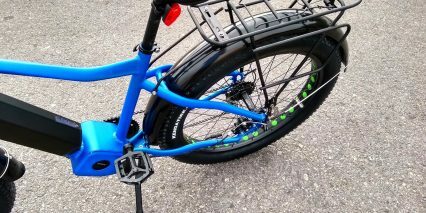 Built entirely around the Bafang BBSHD 1000w motor, this bike packs a wallop in torque and power, yet still is refrained by the city accessories adorning this fat tire bike. 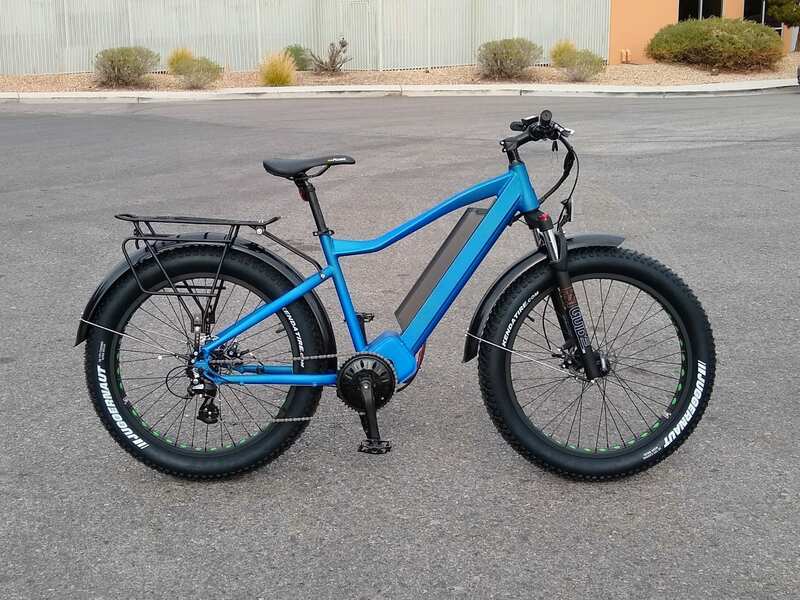 One important note is the the 1000w motor on this bike pushes it into a classification outside accepted eBike laws in many states. 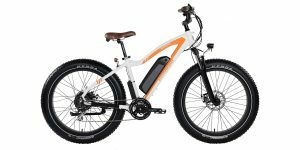 It’s common to see eBike laws cap at 750w for the bike to be considered a legal bicycle or legal electric bicycle. As a result, the EUNORAUT FAT-HD may be a legal moped or motorcycle. Be certain to check your local laws and regulations before venturing into protected or public areas. 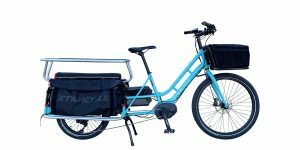 On the features list we have the two height pannier rack has a wide plate and the spring tensioned arms for holding small, pliable items, and the metal fenders are a great plus. With plastic fenders it’s just my luck to have to adjust them constantly to prevent wearing and rubbing against the tire of the bike. Metal fenders stay in place much better, especially when encountering loose and packed terrain such as mud. The strong 13ga spokes are well fitted for the size and torque of the system, and the wheel punch-outs make for a great look on the bike overall. 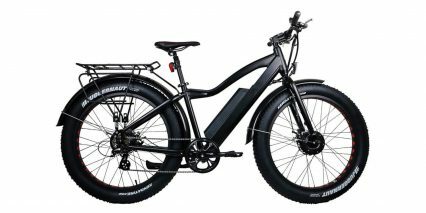 For the mechanical gear set, the 7 speed Shimano Altus works, but the temptation of immense electric power at the throttle is too great to succumb to mere pedaling. 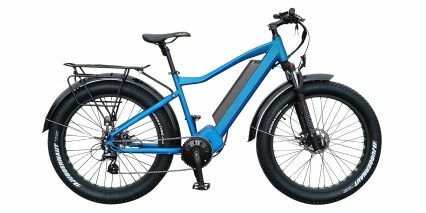 Equipped with mechanical disc brakes, the FAT-HD could be a viable option if the bike was limited to lower speeds, however with a heavier bike, traveling at high speeds I would encourage those interested in this bike to opt for brake upgrades (either locally or from EUNORAU direct). 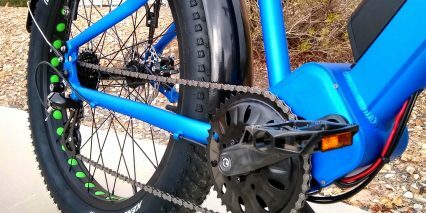 With a monster bike like traveling at high speeds, the brakes will require adjusting more often to stay optimal, these stock mechanical discs are easier to fix over hydraulic, but do require more fixing in the first place. The FAT-HD does include a front head-light, that is integrated into the main battery. This is great for being seen while commuting, or lighting a dark trail as the sun goes down. The rear light on the FAT-HD is detachable light that operates on two (included) AAA batteries. 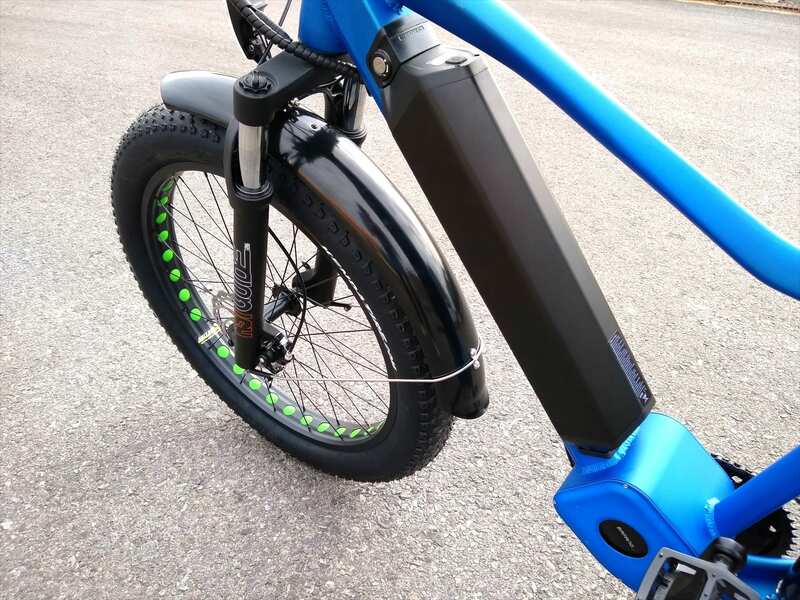 It’s too bad they didn’t include an integrated light on the rear of the bike, however I appreciate they did include a light at all, something some bike companies opt out of completely. The motor on the FAT-HD is really the focal point of the bike. Come to think of it, it’s also the central point: utilizing a mid-drive motor, the FAT-HD can produce an immense amount of torque and move the rider up very steep inclines without hesitation. 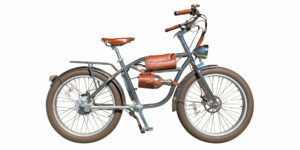 The BBSHD motor from Bafang has been popularized in conversion electric systems, but in the case of the EUNORAU FAT-HD, the motor is encased in a hard metal shell, and the bike is designed to use this motor from the get-go, rather than adding to a bike in witch the the original designer had never considered electric. 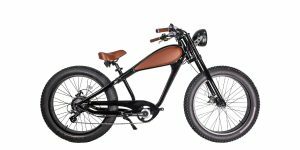 The hard metal case protects the motor from abrasions and obstacles while riding in un-even terrain, and the motor is tilted up into the down tube, rather than arching downward as it does in some conversions. The 1000w of power is simply phenomenal at catapulting the rider into the wind! My only hesitation on declaring a total top speed is the lack of length for testing ground. I was able to get the bike up to 28mph fairly quickly, but ran out of “runway” space before having to slow down and maintain a semblance of safety. Weather full-throttle, or pedal assist the bike could reach speeds very well, keep up in traffic on par with everything in the area. 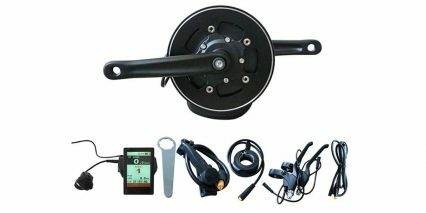 This motor utilizes a cadence based pedal assist system. 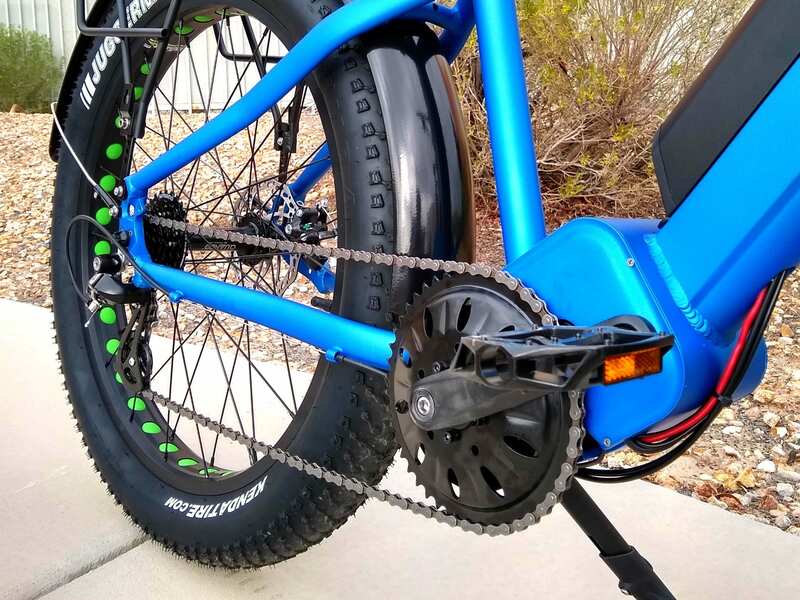 What this means is, when the electric system is turned on, and the pedal assist is activated on the display, from this point on pedaling the bike will engage the electric motor to power the chain, and therefore the bike. The specification “cadence based” means that the pedal assist knows how much power to deliver based on counting the rotations of the pedals. Systems like this are quite prolific in the industry, and are especially nice for riders that have issues with keeping tension on their legs during regular riding. With a cadence based system set for a high level, the rider can rotate the pedals as a formality and keep the bike riding very fast. The motor casing leaves room for the name plate and the cables to escape from the bottom of the bike, which is great for servicing the motor. 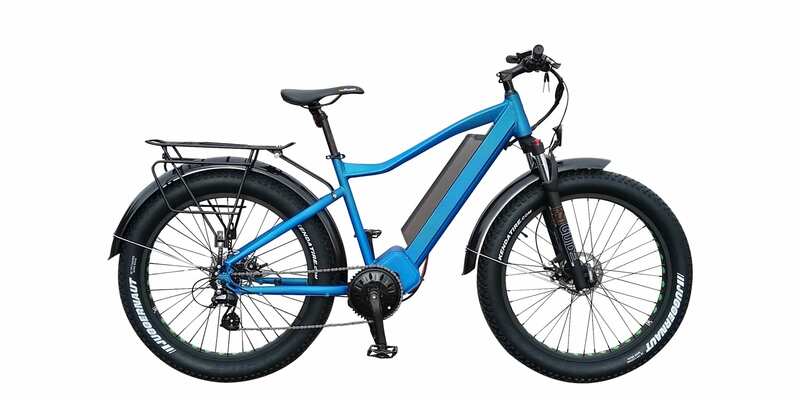 It’s common to see electric bikes using 36v 14Ah batteries, or a 48v 10Ah in other cases, but the FAT-HD is rocking a 48v 15Ah battery which has the 48v pressure to keep the bike reaching high torque, but also has the 15Ah to maintain for a fair distance. I’ve had the chance to range test many electric bikes until the battery stops, about 30 in all. This particular set-up is one I haven’t had the pleasure of testing, primarily due to the high top speed. With that in mind, I will give my professional estimate as to the anticipated range while road riding this kind of bike. Having tested 4 different 28mph bikes and their 20mph counterparts, I can report that the higher top speed has shown a pattern of depleting the battery about 60-100% faster. 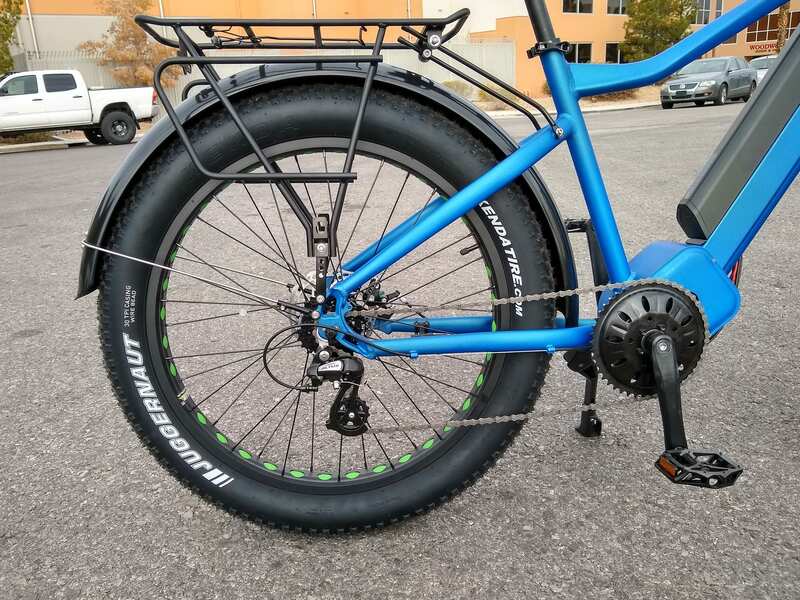 Given the weight of the bike, along with the increased surface area of the tires I would estimate about 35-40 miles of road-riding range using pedal assist at 20mph. Blasting at 28mph, I would venture about 17.5-20 miles. At speeds of 30+? I really can’t say with confidence as I’ve only done short trips at high speed (any trip is short at that speed), but I would toss out about 14 miles or so at full pedal assist, maybe 10 at full throttle with no holds barred. It’s a great addition to the bike to have a battery capable of this kind of performance, and longevity. 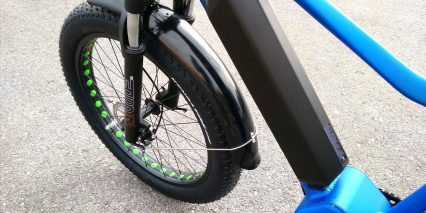 The battery locks into position on the downtube, keeping the weight centered and lower on the frame as compared with rack-mounted batteries. 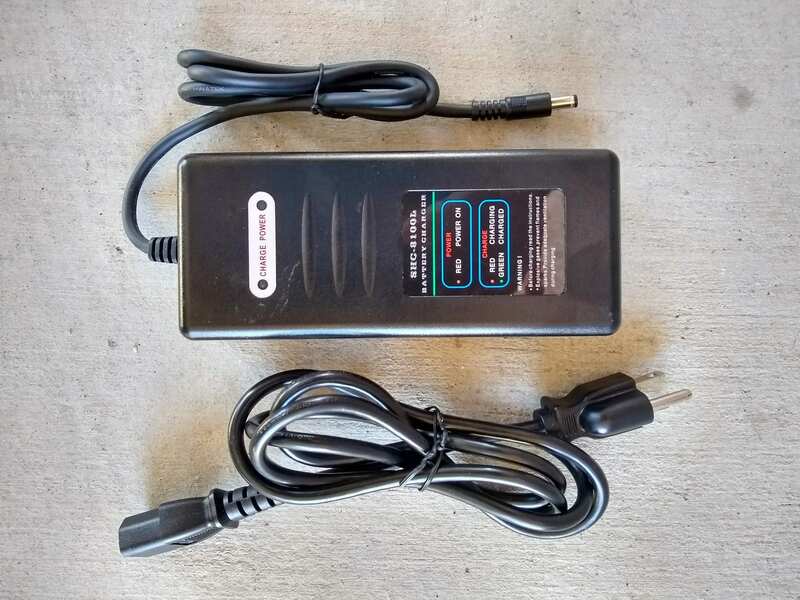 The battery includes a specific key that is required to remove the battery, however, the key is not required for ignition or starting the electric system. 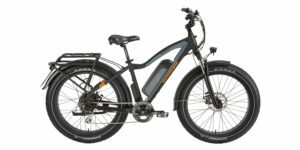 The bike includes a 3a charger, which is great paired with the overall watt hours of the battery (748.8wh). 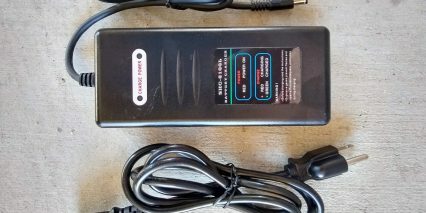 In this case, charging the battery from a full discharge would take about 4-5 hours. Aside from its off-road capabilities, I think this bike has a great place on the road as well. The presence of metal fenders and a rear rack first sparked the idea of a winter commuter. 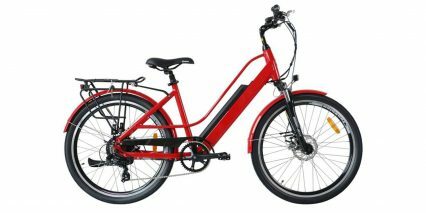 One great way of using an electric bike in the winter is to lower the seat allowing the rider to extend their legs on either side to maintain balance on slippery terrain. Of course, this lowers the effectiveness of the rider’s contribution through maximum leg extension, but the thrill can’t be beat! I’ve ridden several Utah winters in this fashion, but in many cases with skinnier road tires. The display is both out of the way, and offers an easy read-out. 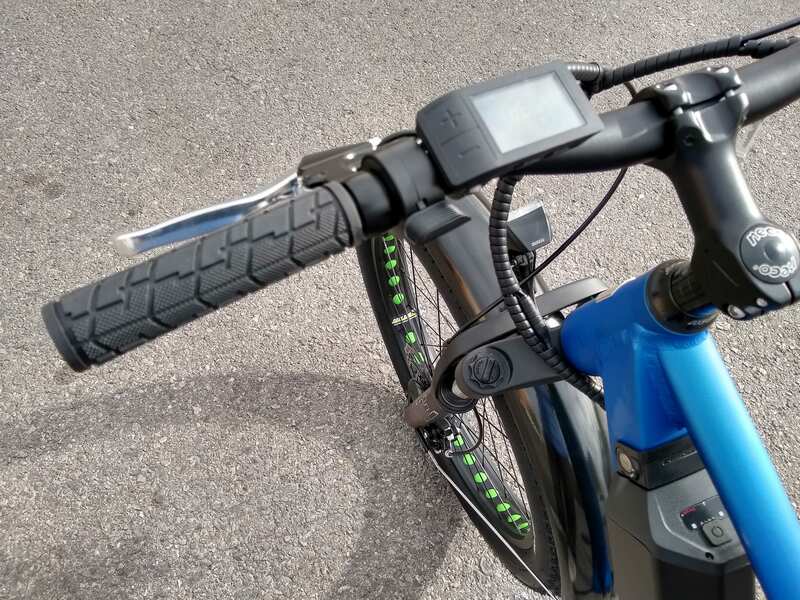 Located on the left side of the handlebars, the display has two main buttons for controlling pedal assist that are easy to locate without having to glance down at the display. The buttons have a vibrating feedback (called haptic feedback) that will buzz a tiny bit when the button is pressed. 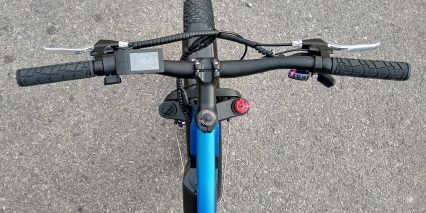 This sort of feature provides a great way of understanding the control the rider has on the bike, and generally improves the ride with more peace of mind. The display, though small, utilizes a full color screen with a very recognizable automobile motif for the speedometer. This enables any rider (who drives a car) to easily recognize the display without having to learn a new system. The display works, and works immediately! 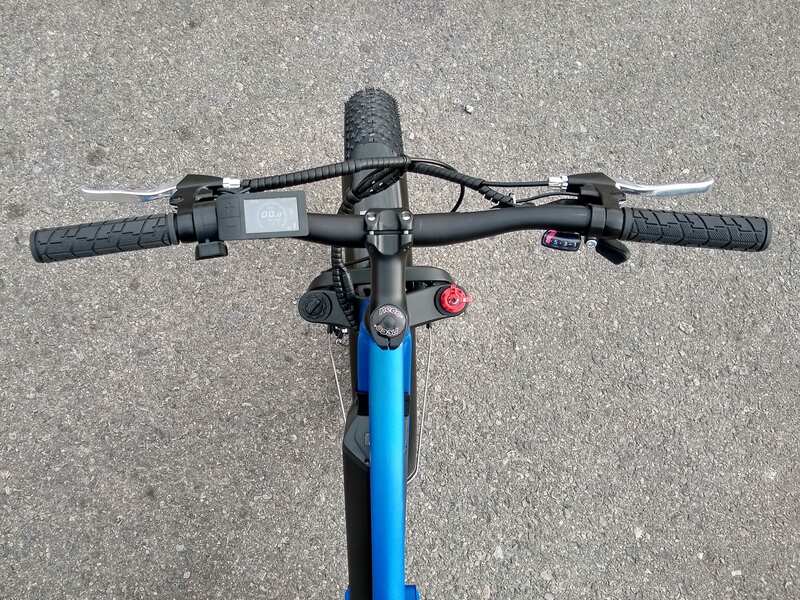 It does lack some customization features, such as a heart rate monitor or cadence counter, but I personally stick to the basics when I’m riding. 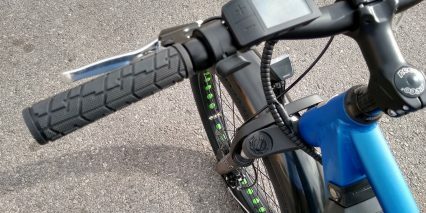 The front LED light on the bike is integrated to the main battery and is toggled easily by the main display. The backlight for the display has two setting, tied into the toggle for the head-light. The backlight feature is really great when riding in low-light conditions, and I really like the automotive styled display that is quick and easy to read. Being in an industrial area, the roads were a bit uneven from excessive wear from heavy industry vehicles frequenting the factories and warehouses in the vicinity. This gave me a great chance to feel the stoutness of the bike and utilize the front fork. 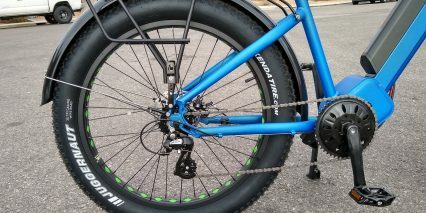 The front fork has a 100mm travel, which is a bit much for road conditions. 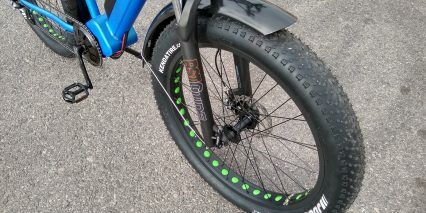 Using the bike off-road, the fork would be utilized more, and the cushion from the fat tires would be greatly magnified. 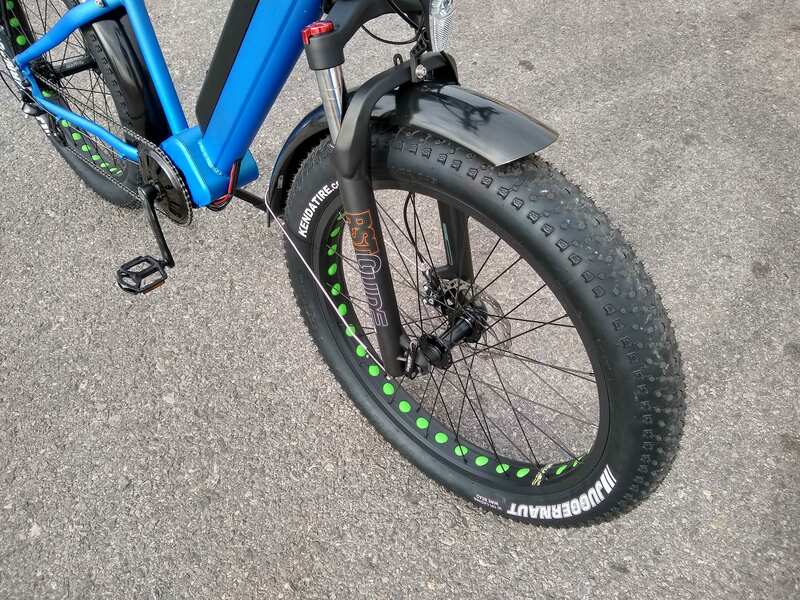 Riding on the road with fat tires provides more comfort and stability, once the rider conquers the odd steering characteristics. Overall, I really enjoyed my time on the FAT-HD. I think it has a unique blend of sheer power, speed and utility, contrasted by the day-to-day accessories that make the bike strangely practical. 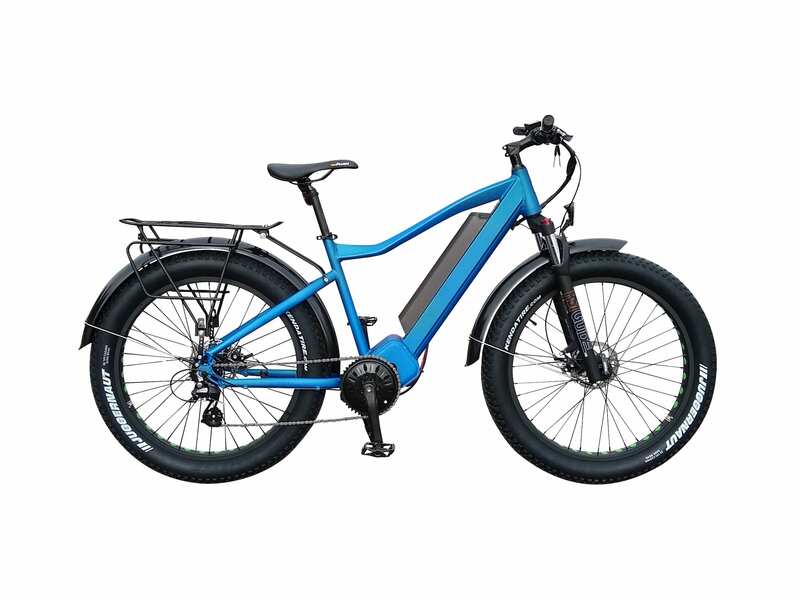 EUNORAU eBikes is a direct to consumer brand based in Hangzhou China, with USA shipping and service support. Kind of a blend of both worlds. Chinese made and sold bikes have one great appeal to them; price. Since China is hub of bicycle manufacturing, the vast resources available to these companies can make for a compelling offer. 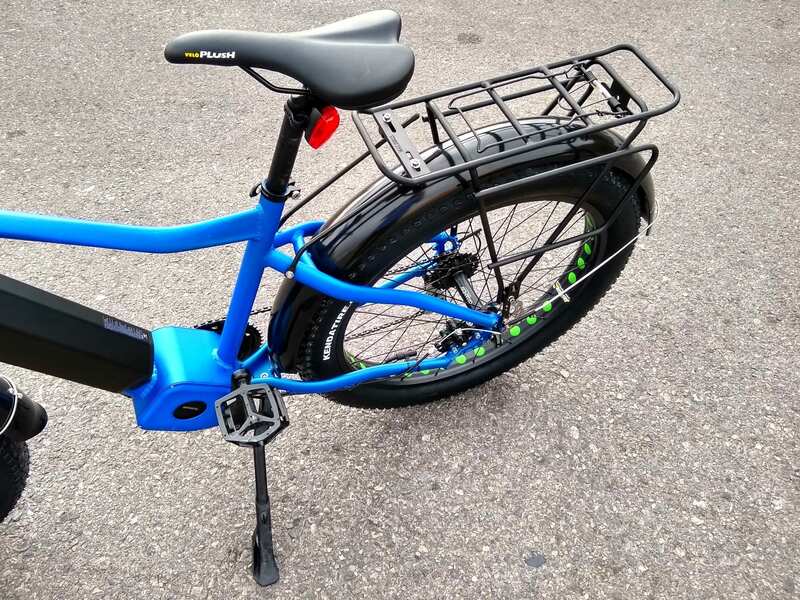 However, in many cases direct bikes take months in shipping, and have literally no support at all, so it’s nice to see EUNORAU filling a less-charted space between affordable price and addressing customer needs. EUNORAU does have some upgrades on offer from their site, though shipping times and availability are not as clear compared to their standard models. I am not sure where all the negativity from Mr. Bill came from without ever seeing or riding this bike. 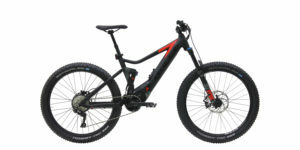 I on the other hand, seeking a thrill and speed rush, will purchase this bike and THEN review it and share my thoughts. I agree with an upgrade to Hydraulic Disc brakes that would be adequate for this system though. 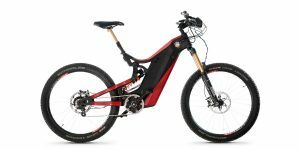 Has anyone actually purchased this bike that could share some thoughts? or worked with EUNORAU in the past?